Having bought some low-budget Walmart vanilla extract that smells nothing at all like vanilla, I figured it’s time to get serious about this stuff. Recipes for DIY vanilla extract abound on the Internet, but as nearly as I can tell, the basic idea is to put vanilla beans in contact with ethanol, shake occasionally for a couple of months, then enjoy. Uh, by the teaspoonful, that is. Quite some years ago I discovered that NYS prohibits the sale of grain alcohol, so you must buy stiff vodka to get high-test ethanol. That glass bottle contains the cheapest 160 proof vodka I could find in the waning years of the last millennium; I figured it was likely to have fewer additives around its 80% ethyl alcohol than anything else in the liquor store. After more than a decade on the Basement Laboratory’s Solvents Shelf (I don’t use a lot of ethanol), a dollop in a saucer burns with an ethereal blue flame: it’s in fine shape. The plastic bottle originally held some weird alien fruity liquid (which, IIRC, I picked up while doing amateur radio duty at a charity event) and has the desirable attribute of a tight sealing lid. It’d be better to use glass and I suppose amber beats clear, but this stuff will spend its entire life in a dark cupboard with all the other spices. 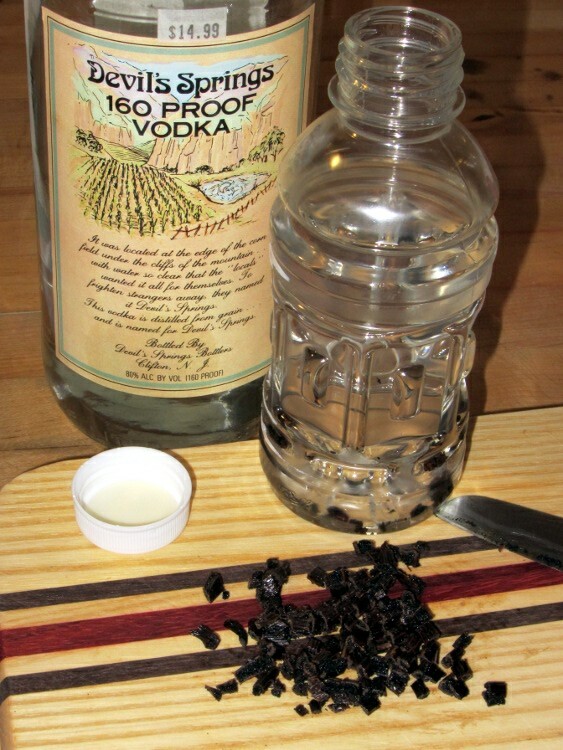 Although some recipes call for sterilizing the bottle in boiling water, I figure any bug that can survive 80% ethanol will shrug off hot water… and the vanilla beans probably aren’t all that sterile, anyway. A cup of neat vodka, three slit-and-chopped vanilla beans, and away we go. It should be ready for the Christmas baking season. If this works, I’ll get a substantial quantity of vanilla beans from the usual eBay supplier and make some really stiff extract. Two bucks a bean at the local grocery store: ouch.